Jada Pinkett Smith says she wants to grow up to look just like her mom - and she is not the only one. The 43-year-old actress posted a picture on Facebook of her mother Adrienne Banfield-Jones in a bikini over the weekend, and the grandmother's beach body puts even those a third of her age to shame. Adrienne is 61 but amazingly sported a six pack - clearly a pack for every decade she's been alive. Emerging from the water, Jada's mother showed off her amazing physique in orange bikini bottoms and a patterned underwire top. Hinting to her wild past, the grandmother also showed off her tattoo located high up on her toned and terrific legs. While most people would be horrified for the world to see their mother in a bikini, Jada could not be more proud. And Jada is well on her way to doing so, as the mother of two - Willow, 14, and Jaden, 16 - also has a fantastic bikini figure which no doubt she got to show off too while the family celebrated Thanksgiving in Jamaica. While having a lot of fun as a family, the star did post a very serious Thanksgiving message on Friday saying she was thinking of the late Michael Brown's family and also football star Ray Rice's wife Tamir - whom he assaulted. 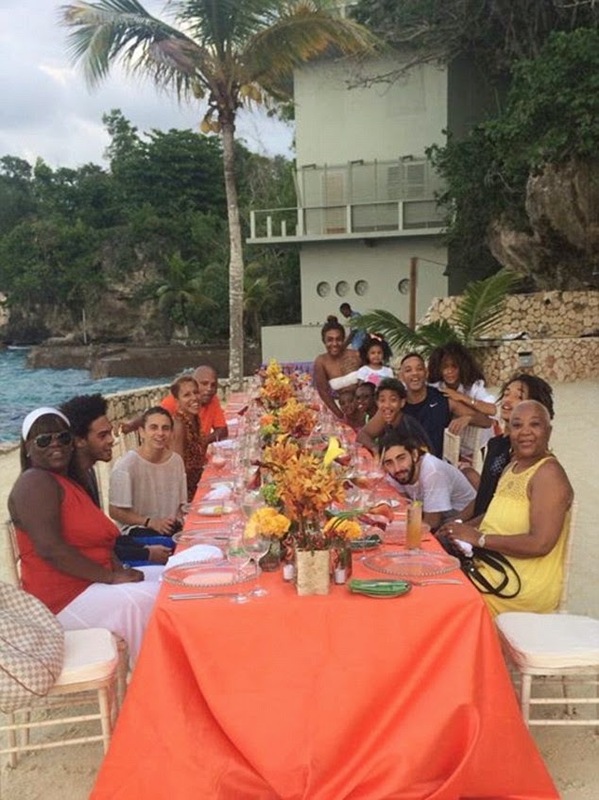 'I'm having Thanksgiving this year in the land of which my grandmother was born...Jamaica. The star posted a picture of her and her family - which included Will Smith, their children Willow and Jaden and Will's son Trey - enjoying their turkey feast on the sand. While Jada's mother had blessed her with great genetics, Adrienne did not bless Jada with a smooth childhood. The actress' mother and grandmother raised Jada after Adrienne found out she was pregnant when she was just sixteen. It was Jada's grandmother who largely looked after the young star as Adrienne battled severe drug addiction for the first 18 years of her daughter's life. Jada sadly went on to follow on her mother's footsteps admitting she too had suffered from a number of addictions.